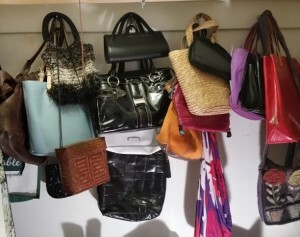 I just had a KonMari Party in my closet and I am only using purses that I love, now!! I am in-process of doing some tidying at my home and office. I’ve been contacting old clients about getting rid of their binders, receipts, cuttings, etc. Also, I wanted to find out if they wanted their fabrics that I have now been storing for up to thirteen years! Yowsers! At about the same time, my kid’s school was having a book fair and there sitting on the stage in the auditorium for sale was… “The Life-Changing Magic of Tidying Up – the Japanese Art of Decluttering and Organizing” by Marie Kondo! I thought to myself, I wonder what an expert might have to offer me as I move through this tidying process. Let me tell you, it’s a “KonMari” Party at my house right now! 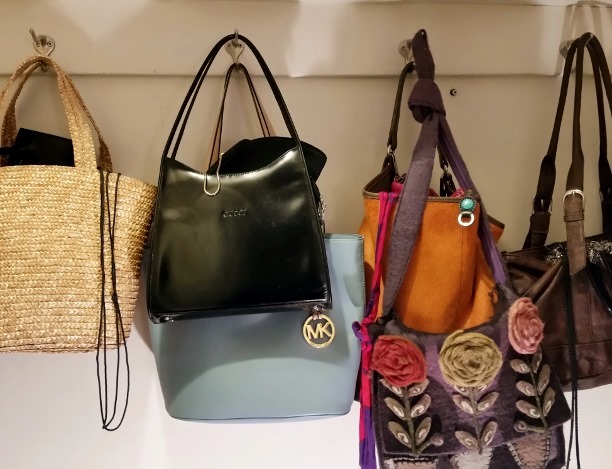 So, what happened here… those are the same 4 hooks in my closet, but they are holding a lot less purses and I can’t help but smile through this whole experience! 1) I said goodbye to the black bag that was my Grandma’s – that eek had mold on it! She doesn’t really want me to hold on to this bag of hers… in her memory!! 2) I said thank you to the purple Kate Spade for carrying my things and to Deborah who gave me this purse and then I sent it to Virginia’s home who is having a Eastern Star Rummage Sale on June 6, 2015 at her home in San Leandro! If you want it, the sale will be on Bancroft Avenue between Callan and Dutton Avenues. 3) I said thank you to the white Nine & Co. purse and to the Black Nine West purse for carrying my things. I sent them to Virginia’s house, also. 4) I said thank you to the Red Louis Vuitton Bag that I purchased with my “X” on a very memorable and fabulous trip to Hong Kong. And, I gave it to Virginia for the sale. 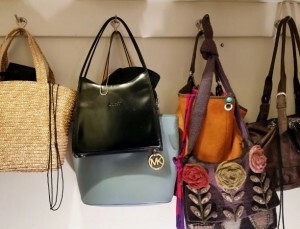 5) So that I know which purse is inside each bag, I hung the handles outside in KonMari style. I put up to two purses inside each purse. I am now left with only the bags that bring me joy! Smile! I went from 18 purses to 13 purses, but only 6 are visible… Nicely done, don’t you think!? And, don’t you just love that blue by Michael Kors! Party on KonMari! Really, I cannot adequately describe how emotionally satisfying this approach is to tidying on the soul, mind and spirit!! And, I personally cannot wait to tackle my next space… I will keep you posted as things progress. If you wish for Leeza Designs to help you KonMari your space, please reach out to me at 415-244-2040 to discuss your project.